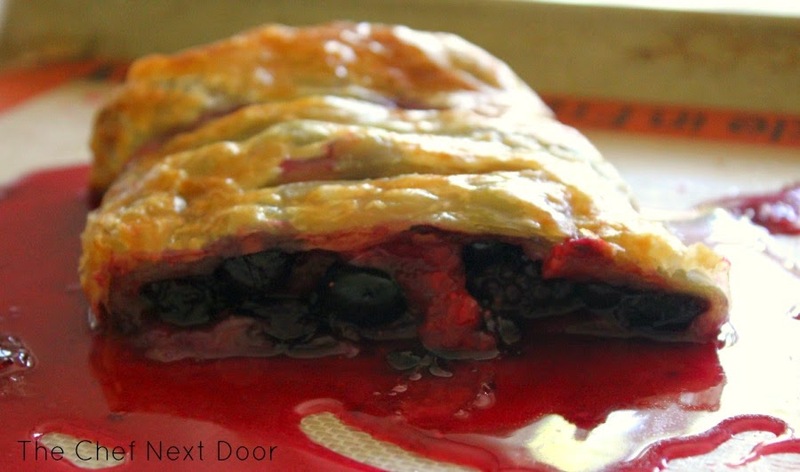 Fresh juicy berries wrapped in a tender flaky crust make the perfect summer treat! Happy Friday ya'll! It's been quite a long week here and I am so ready for the weekend! And just in time for your weekend cooking I've got an awesome recipe to share. 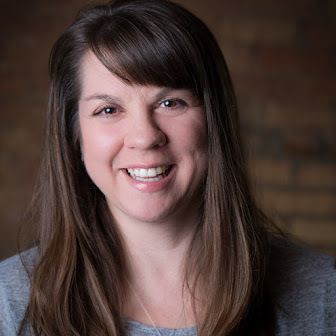 I know you've heard me talk about an amazing Facebook group that I am part of, Spoonful of Foodies. If you haven't checked out the group yet, please do! We share tons of recipes and tips and just have lots of fun together. The admins of the group decided to do something fun this month and have a recipe swap. We each picked a recipe from our blog that we wanted someone else to make, either by following the exact recipe or by changing it up a bit. I chose to remake Trisha's delicious Apple Pear Cranberry Strudel! Since it's summer, I was inspired by the delicious fresh berries at the market and decided that would be my twist! 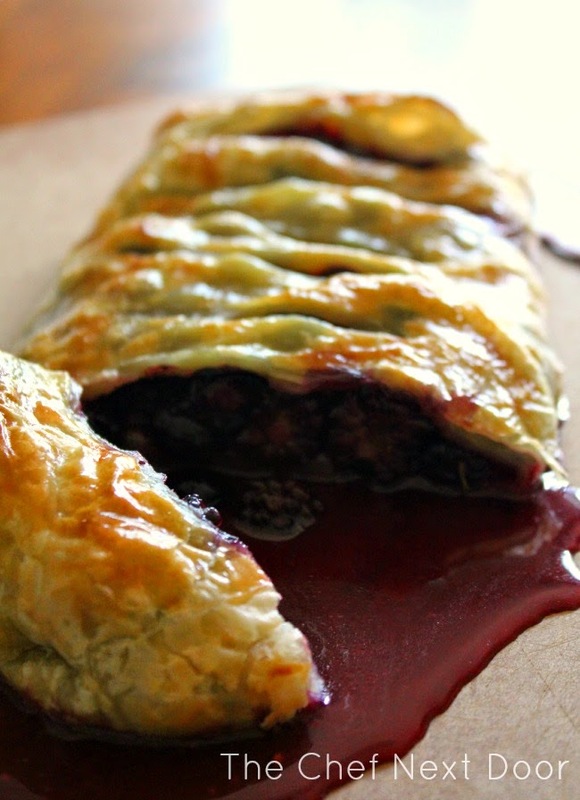 This Triple Berry Strudel is absolutely delicious, and I cannot wait to try Trisha's version soon as well! 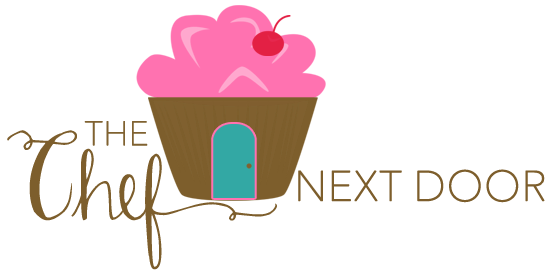 If you haven't stopped by Trisha's blog, The Lazy Mom's Cooking Blog, you need to do so right away! Her recipes are amazing and her photos are stunning. Her Grown Up Mac and Cheese is calling my name! Preheat the oven to 400 degrees. In a large bowl gently toss the berries with the sugar, cornstarch and salt until fully incorporated. Set aside while you prepare the pastry. On a baking sheet lined with parchment or a Silpat, lay down one sheet of puff pastry. Using a lightly floured rolling pin, roll out the pastry into a long rectangle. Spoon half of the fruit lengthwise down the center of the pastry. Fold in the short ends first, then fold over the long sides one at a time making sure everything is tucked in. Carefully turn the strudel over so the seam side is down. Repeat the steps above and make a second strudel with the remaining pastry and berries. Lay the two pastries side by side on the baking sheet. Using a pastry brush, lightly brush the beaten egg all over the tops of both strudels. With a sharp knife, cut about six slits into each strudel. Bake the strudels for 22-25 minutes, or until golden brown on top. Allow to cool on the baking sheet for 15 minutes before slicing. Serve warm.